Is MSNBC Starting to Edge out Joy Reid? Her Sunday Schedule Pushed Back for a Soccer Game? UPDATE: 10/23/2017 …Happily, Joy is busier than ever!!! Update: Joy is subbing for practically everyone and in an interview she stated that she really enjoys seeing how all the shows work. She is appearing on Meet the Press occasionally, and recently went to the Virgin Islands to report on the hurricane disaster there. She continues to report on the Puerto Rico and the Virgin Islands. Joy Reid had her own show during the afternoons that was axed around the time that Alex Wagner’s NOW , the Cycle, Ronan Farrow Daily and The Ed Show were cancelled in February 2015. The Reid Report was struggling with low ratings as was the whole lineup. Reid stayed on with the network, filling in and covering the 2016 campaign and became more visible and a real stalwart. She was rewarded with her weekend AM Joy program which is a top destination for thinking people. (Of course, she COULD have been given the slot have Greta Van Susteren was given but…) Her show is delivering great ratings and Joy has been writing books and as well as essays at sites like the Daily Beast…so, she’s blossoming as a media star. See her outdated MSNBC bio here: Joy Reid outdated biography MSNBC. BUT…as Joy Reid’s audience grows, could this be a bit too much for MSNBC? Today, Joy’s show is being pushed back 2 hours because there is a Premier League soccer match that MUST be shown in her regular Sunday time slot. ????? Now, I’m a huge soccer fan…was one before it became more popular. I had season tickets for the Cosmos at the midfield line just behind the players’ family section at the old Giants Stadium, where I saw all the greats. Back in the late 70’s/early 80’s I was writing letters and calling Don Imus to lobby for coverage because the media was blacking out most coverage. For example, while 34,000 of us were watching a game in the rain, the only news was that baseball had been rained out. I can say that my letter to the New York Times was published and Imus reported the score of that game! So, my sports activism worked! So, now, as someone more devoted to political activism, I have to call into question what’s going on at MSNBC…and today, specifically, the decision to push Joy Reid back 2 hours so a Hull-Tottenham match is aired instead of the best discussion of current politics. I’ll be revisiting the Lack influence at some point since his bio discusses his former life at Bloomberg…..
Hey, all you loving parents out there who want good schools for your kids and a brighter future for them! OK, I know you’re grappling with the idea of Betsy Wetsy DeVos wrecking the schools academically, but hell, at least if you are of limited means you can be somewhat consoled that at least your kid may have access to some fairly decent food at breakfast and/or lunch Right? Attention, poor people! This meal is NOT for you! Michele Obama, of course, worked damned hard to get kids aware of eating better and also pushed for better quality school lunches…and rules were changed to move the ball forward on that score. WHOLE GRAINS, instead of mysterious foam slices. Vegetables that really were vegetables instead of that leftover ketchup from the Reagan days. But, now you’ve got a problem. In the middle of all this sturm and drang over Russia, Comey and the antics of this pretender of a President, things are happening that will affect stomachs. Agriculture Secretary Sonny Perdue said Monday that he would roll back part of former First Lady Michelle Obama’s healthy eating initiative: stricter nutritional standards for school lunches. The Obama administration placed standards on school lunch nutrition in 2010 when it passed the Healthy, Hunger-Free Kids Act. During that time, Michelle Obama was seen by many as a leading advocate in the fight against childhood obesity. She started the Let’s Move! campaign, which sought to encourage children to take part in more physical activity and help provide healthier food options in schools in under-served communities. The percentage of U.S. children with obesity has more than tripled since the 1970s, causing long-term physical and emotional distress for children, according to the Centers for Disease Control and Prevention. Children with obesity are at higher risk for having asthma and Type 2 diabetes. Many are bullied and, as a result, are likely to suffer from depression and self-esteem issues. In 2014, the standards were met with challenges in Congress led by the School Nutrition Assn., which has called the regulations too rigid, and House Republicans who supported the powerful lobbying group’s efforts. But according to the Department of Agriculture, 97% of schools across the country are implementing the school nutrition standards set by the Healthy, Hunger-Free Kids Act. Speaking a health conference in Washington D.C., former First Lady Michelle Obama took a veiled shot at President Donald Trump for gutting her program designed to get kids to eat healthier. Responding to reports that Trump Agriculture Secretary Sonny Perdue was considering delaying a requirement to lower sodium levels in school meals and would continue to waive a requirement that schools serve more whole grain food, Obama criticized the wisdom behind the moves. This blunt reaction is welcomed, of course, but not so welcome is a story that is up at Shareblue today originated at the Washington Examiner (Note the upbeat headline on this one…) But, the focus of the article is really about how Office of Management and Budget Director Gnome Mick Mulvaney is out delivering the Republican message on healthcare that specifically targets …DIABETICS! But don’t despair if you fall into one of these groups…you are helping Trump be a “winner” and you should be PROUD that you are helping the GOP set the clock back as YOUR time runs out! P.S. Sarah Palin will chug a giant soda in your honor!!! So Trump is “Changed” by a Gas Attack…And It’s “Bombs Away”… Meanwhile…. He’s escalated drone strikes and wants the policy regarding the sparing civilians to be gone…http://www.truth-out.org/news/item/39914-amid-spike-in-civilian-deaths-from-us-strikes-trump-requests-lifting-policy-limiting-casualties …. Etc, etc. as the abuses pile up…. But SUDDENLY, Trump is so touched by the attack in Syria that he is “changed” …. I guess dead refugee children washing up on the shores of the Mediterranean after escaping from Syria isn’t bad enough…and those freezing in camps and unable to travel onward are just…well, who cares? Who thinks we are being played as the media pundits furrow their brows about how Russia will react? Perhaps the Trump crowd consulted with the Russians…to fire a bunch of missiles on an airfield which was OK with Russia. The Russians can supply more planes if they want to. No Russians got zapped. A lot of tarmac got blown up….MAYBE some gas? But what really changes?? OH, WAIT…they DID NOT TEAR UP THE AIRSTRIP!!! Maybe a few oil tanks, etc. but the airstrip is apparently ship-shape!!! So Putin’s friend Trump gets a change of story from the Russian ties/interference story, gets a bump in the polls, and T. Rex Tillerson goes over there as planned and talks oil deals? Assad stays put and it’s business as usual? Do you really think Assad is going to go? Do you really think that Trump is going to really do something to upset Russia over their ally Assad? Sen. Harry Reid bid farewell to the Senate Thursday after 30 years in the chamber and more than a decade as top Democrat, a remarkable run during which he shepherded key Obama administration legislation including the sweeping health care law. But Reid leaves with his Democrats stuck in the minority despite his best efforts, and Republicans and President-elect Donald Trump making plans to repeal President Barack Obama’s signature law as their first order of business next year. According to America’s Library, the Gilded Age spanned the period from 1878-1889 although other sources will use the years in the late 19th century from the 1870’s to 1900. The growth of industry and a wave of immigrants marked this period in American history. The production of iron and steel rose dramatically and western resources like lumber, gold, and silver increased the demand for improved transportation. Railroad development boomed as trains moved goods from the resource-rich West to the East. Steel and oil were in great demand. All this industry produced a lot of wealth for a number of businessmen like John D. Rockefeller (in oil) and Andrew Carnegie (in steel), known as robber barons (people who got rich through ruthless business deals). The Gilded Age gets its name from the many great fortunes created during this period and the way of life this wealth supported. While the rich wore diamonds, many wore rags. In 1890, 11 million of the nation’s 12 million families earned less than $1200 per year; of this group, the average annual income was $380, well below the poverty line. Rural Americans and new immigrants crowded into urban areas. Tenements spread across city landscapes, teeming with crime and filth. Americans had sewing machines, phonographs, skyscrapers, and even electric lights, yet most people labored in the shadow of poverty. (snip) Corruption extended to the highest levels of government. During Ulysses S. Grant’s presidency, the president and his cabinet were implicated in the Credit Mobilier, the Gold Conspiracy, the Whiskey Ring, and the notorious Salary Grab. Europeans were aghast. America may have had money and factories, they felt, but it lacked sophistication. When French prime minister Georges Clemenceau visited, he said the nation had gone from a stage of barbarism to one of decadence — without achieving any civilization between the two. Does much of this sound familiar? Many years ago, as I dreamed of becoming a journalist, I read about muckrakers, devouring The Autobiography of Lincoln Steffens and a biography of Ida Tarbell. Tarbell never wrote the biography of Roland but she did write biographies of Napoleon Bonaparte and Abraham Lincoln—published shortly after her return to the United States in 1894. She also accepted an offer from McClure to work for his new venture, McClure’s Magazine, where she undertook her most famous work, her expose of John D. Rockefeller’s Standard Oil Company. Her study of Rockefeller’s practices as he built Standard Oil into one of the world’s largest business monopolies took many years to complete. McClure’s Magazine published it in 19 installments. Her work was a sensation and the installments became a two-volume book entitled, The History of the Standard Oil Company, published in 1904. Tarbell meticulously documented the aggressive techniques Standard Oil employed to outmaneuver and, where necessary, roll over whoever got in its way. A short while later, President Theodore Roosevelt used the phrase “muckraker” (from John Bunyan’s The Pilgrim’s Progress) in a speech in reference to Tarbell, Upton Sinclair, Lincoln Steffens, and other journalists writing critically about the tremendous power of big business. Tarbell actually objected to the term, for she felt it belittled work she believed to be of historical importance. So, the question is now, who are the journalists that will “muckrake” during Trump’s time in office? They are out there, we see them tweeting and many websites are trying to do the job but you won’t see them in great numbers on TV. And, how many Americans actually care? New polling shows that Trump supporters are completely ignorant of facts and he will play to them, rather than to the majority of Americans who have no faith in him. Look at his picks for his cabinet. In almost every case, they represent the complete opposite of ideas he campaigned on. Example: he promised to raise the minimum wage, but appoints a CEO who is adamantly opposed to the concept! But his crowd continues to cheer, even though many are going to be hurt by his actions. Trump ran on economic populism and stirring up hate. During the Gilded Age, the excesses of wealthy businessmen stirred up “a widespread feeling of unrest and brooding revolution.” Trump has conned his devotees to revolt against the status quo…but the question now becomes this: Do they ever realized they’ve been conned, and if they do, when do they revolt against Donald Trump, who is himself a robber baron? Or do they simply wallow in their hate and never understand what he is doing? Unfortunately, there is a good chance that no amount of muckraking will affect Trump unless his faithful suddenly feel pain in their wallets. 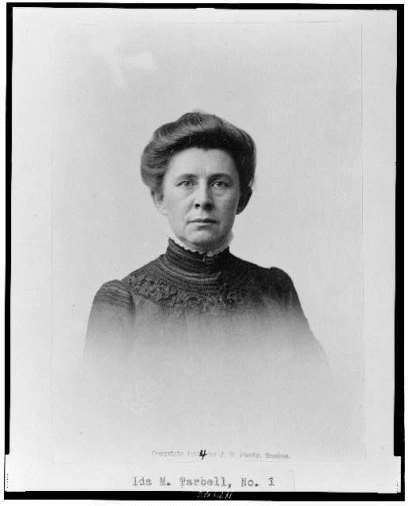 One has to wonder if even Ida Tarbell could even deal with the swamp that Trump calls home as the Tweets roll out thick and fast. Nor is there indication that any sudden awakening will propel us into a new Progressive Era. We should be so lucky. But much of the effort needed will have to focus just on RESTORING everything that is lost. Just keeping our heads above the muck to prevent us from sinking completely will be exhausting. The old battles will have to be fought again. REPOST 8/15/17: As President, Which Type of Rally Will Trump Go For on His “Thank You” Tour? “No Frills” or Nuremberg? August 15, 2017 I am pinning this in light of Trump’s comments regarding the terror in Charlottesville, VA.
UPDATE: November 30, 2016…I have changed the title of this post to reflect the new name for Trump’s current tour, formerly called the “Victory Tour,” now called the “Thank You” tour. Yes, while he needs adulation as his drug of choice, the really important thing is to get out and meet his followers…yes, it is sweetly “old-fashioned.” Normal Rockwell would be proud! President-elect Donald J. Trump won the White House with an outsider’s populist promise to “drain the swamp” of Washington. Now, as he prepares to assume the presidency, an open question remains about the capital he repeatedly spurned: Just how much is he willing to become a part of it? Mr. Trump, a homebody who often flew several hours late at night during the campaign so he could wake up in his own bed in Trump Tower, is talking with his advisers about how many nights a week he will spend in the White House. He has told them he would like to do what he is used to, which is spending time in New York when he can. Returning home to Trump Tower from the White House may not be Mr. Trump’s only embrace of the familiar. His aides say he has also expressed interest in continuing to hold the large rallies that were a staple of his candidacy. He likes the instant gratification and adulation that the cheering crowds provide, and his aides are discussing how they might accommodate his demand. Now, apart from wondering if Trump is actually going to do any work himself or just past it all to his staff while he gets his “rally rush,” one has to wonder what these rallies will be like. The glue that held the Fascist regime together was Mussolini’s cult of personality. Fascism never developed into a coherent doctrine, recognizing itself best by what it was against: Fascism meant antiliberalism, antisocialism, antifeminism, and, after 1938, anti-Semitism. For the general public, Fascism acquired real meaning in the larger-than-life figure of Il Duce. A vast propaganda machine directed by the Ministry of Popular Culture churned out newsreels, radio broadcasts, and newspaper stories glorifying Mussolini. The Fascist Party choreographed huge rallies at Mussolini’s Roman headquarters at Piazza Venezia, where Mussolini harangued the crowds with rousing speeches. A common propaganda axiom held that “Il Duce is always right,” and that youth should learn to “Believe, obey, fight.” Mussolini’s posturing lent itself to a kaleidoscope of propagandist images: Il Duce as family man, photographed with his five children; Renaissance talent playing the violin; hero of the peasants, harvesting grain bare-chested; brave commander in chief flying a fighter plane. Mussolini reached the peak of his personal popularity when he led Italy to victory over the Ethiopian empire in May 1936. Then there is the rally based not only on oratory, but also on true spectacle and staging, rallies not just composed of run-of-the-mill large crowds. This type of rally would really ramp up Trump’s mainlining of adoration and leave his supporters in awe. Scrolling through pictures of the Nazi Party Congresses, it’s really very hard to choose which one would be most appropriate. The Nazi Party relied on spectacle to impress German citizens and wow true believers. Beginning in 1933, once Adolf Hitler ruled the country, the annual rally in Nuremberg became a shining example of the power of German propaganda. Each year, the rallies grew larger and more impressive, and Hitler’s speeches became progressively more sinister. The rally in 1939, scheduled to begin on September 2, was cancelled at the last moment—Hitler and Germany had invaded Poland the day before. But the 1937 “Rally for Labor” style would really appeal to all his working-class followers because it celebration of the “reduction of unemployment in Germany after the Nazi rise to power. It had fallen from 6 million at its peak to 1 million. Hitler did this by emphasizing manual labor, restricting companies from using labor-saving machinery, and keeping wages low.” Yeah, that “keeping wages low” bit is right in keeping with Trump at one point telling his followers that Americans were getting paid too much. When we can have this?